A new Steinernematid nematode species isolated from central part of India was named as Steinernema dharanaii sp. 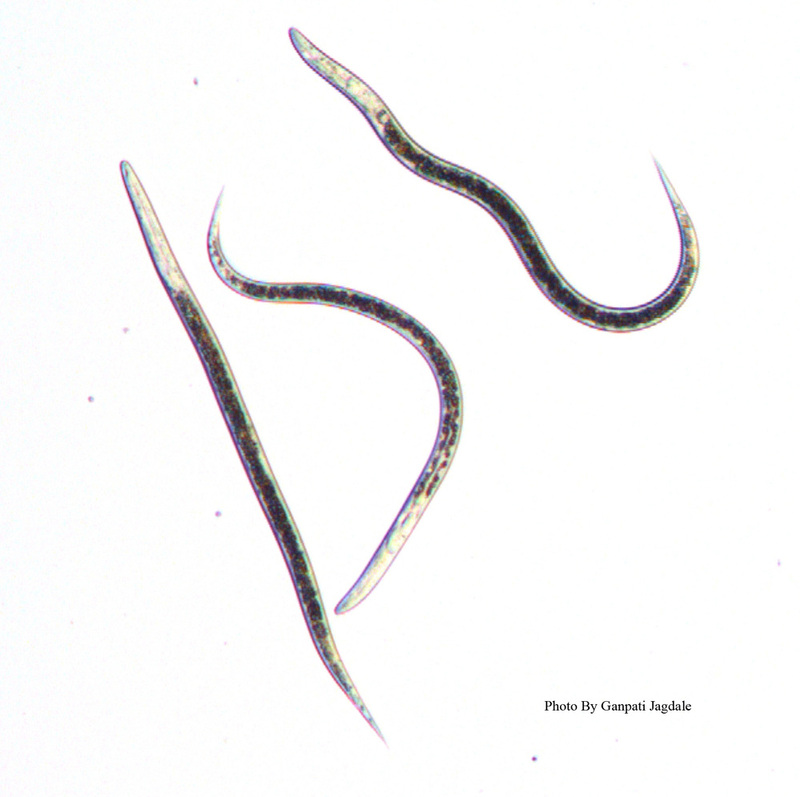 n. (Nematoda : Steinernematidae) by Kulkarni et al (2012) using both morphological and molecular techniques based on ITS rDNA. These researchers found that this new species was closely associated with 'glaseri-group' of Steinernema spp. but its infective juveniles (Fig. 1), males and females had distinct morphological characteristics. Infective juveniles of Steinernematid nematodes generally carry species specific symbiotic bacteria (Xenorhabdus sp) in their gut and use them as weapons to kill their insect hosts. However, there is no information available on the association of specific symbiotic bacteria with Steinernema dharanaii (Kulkarni et al., 2012). Since this new nematode was recovered from soil collected from teak (Tectona grandis) plantation, it may be pathogenic to insect pests of teak plants. Teak (Tectona grandis) is one of the high quality timbers grown the tropical climates of the world. The high qualities of this timber include durability, lightness with strength, easy seasoning with no splitting and cracking, ease of working and carving. This timber is also resistance to termites, fungus, and weathering but they a lots insect pests that damage trees. The major Insect pests of teak include a teak defoliator (Hyblaea purea), teak leaf skeletonizers (Hapalia macheralis and Eutectona machaeralis), leaf roller (Sylllepta straminea), shoot borer (Nodostoma bhamoense) and pod borer (Dichocrocis punctifearlis). Different stages of these insects may be susceptible to different beneficial entomopathogenic nematode species including Heterorhabditis bacteriophora, Heterorhabditis indica, Steinernema carpocapsae and Steinernema felitae. Researchers in tick plantation area should test the pathogenicity of above stated different species of beneficial entomopathogenic nematodes especially locally isolated new species, Steinernema dharanaii (Kulkarni et al., 2012) and warm adapted Heterorhabditis indica nematode (which was originally isolated from Coimbatore, India) against different stages of different insect pests of teak (Kulkarni et al., 2011). Read following papers for complete information on morphological and molecular characteristics of Steinernema dharanaii and efficacy of entomopathogenic nematodes on insect pests of teak. Kulkarni, N., Rizvi, A.N., Kumar, V., Paunikar, S. and Mishra, V.K. 2012. Morphological and molecular characterization of Steinernema dharanaii sp. N.: a new entomopathogenic nematode from India. Indian Journal of Tropical Biodiversity 20:107-116. Kulkarni, N., Paunikar, S. and Hussaini, S.S. 2011. Susceptibility of Teak Skeletonizer, Eutectona machaeralis (Walker) to the EPN, Heterorhabditis indica Poinar. World Journal of Zoology 6: 33-39.